The alt-pop star is caught in a bad romance. 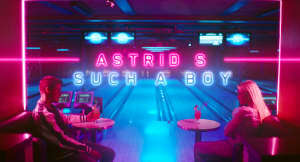 19-year-old Norwegian pop star Astrid S' scenic new video "Hyde" would be the ideal commercial for a romantic getaway in Iceland—where it was shot—if it weren't for all its unnerving undertones. Produced by prolific Norweigan artist Lido (also known for his collabs with Halsey and The Social Experiment), it's a slithering pop tune full of paranoia that doesn't feel too far away from L.A.'s Banks, and it provides an eerie backdrop to a video that's full of covert glances and uneasy embraces. “’Hyde’ is a song I wrote after reading the story about Dr. Jekyll and Mr. Hyde," Astrid told The FADER via email. "It’s about how you can just become another person by being drugged, drunk—or even in love. And not being aware of it." Watch the video (directed by Hörður Sveinsson and Helgi Jóhannsson) above; "Hyde" is out now.